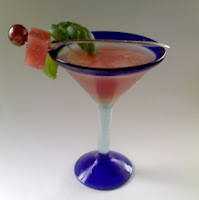 For those long, hot summer days when your throat is dry and your mouth is parched, here's a refreshing watermelon cooler in a martini glass. With a little bit of muddled grapes, basil and a little zest of lemon for some sweet tang. A very enjoyable libation for the dog days of summer.